← Russian News From Russia: September 26th, 2009! 1 cup Mayonnaise or Miracle Whip – according to which part of world you are from! Cook potato cubes until done (firm not mush) – Drain. Add can of peas and can of carrots – drain excess liquid off – Mix with the hot potatoes to help cool the potatoes down. 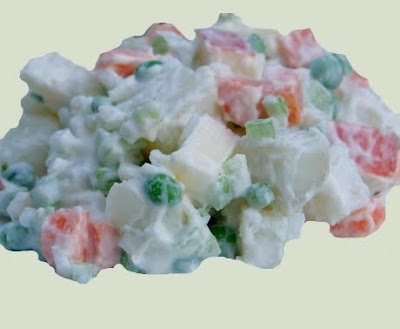 Inportant – While still warm, add diced onion, mayonnaise, sour cream and diced eggs. Potatoes will absorb moisture as it cools in refrigerator. So you may want to add more mayonnaise if you so desire. Once cooled – you can garnish with an extra sliced hard boiled egg and parsley if desired. Paprika is nice to sprinkle on top.